There’s no greater agony as a mother than watching your child live with pain and discomfort and being powerless to help. But that’s exactly how it was for Kathryn, mother of two-year-old eczema sufferer, Aria. Trying treatment after treatment with no solution, Kathryn could only watch on helplessly as Aria experienced frequent flare-ups that left her skin itchy, inflamed, dry, sensitive and her baby girl in pain. 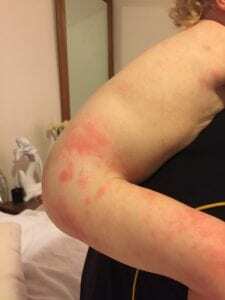 “My Daughter, Aria who is nearly two years of age suffers from eczema. The last few months have been constant flare-ups, and we are on a journey to find out what allergens or factors are causing/aggravating this. Using other creams, ointment and oils would sometimes help and would get us by at times. Her skin would soak these products up quickly but not retain moisture for long. Her skin would still look dry and flaky again throughout the day. We had a particularly bad flare up where her skin quickly became very inflamed, very warm to touch and looked extremely red. Where it wasn’t red, her skin texture was bumpy. And then Kathryn, who was already using Biologi Bf serum herself, learnt that the extract of finger lime was safe on children and may help with her daughter’s inflamed skin. “I continued to try natural healing creams, oils and ointments to try and calm her skin down for four days before deciding to use the BF serum that I had on hand. I thought a serum wouldn’t be enough, being a thin consistency in comparison to creams and ointments. After a bath and before bed we applied the Bf serum. By the next morning, I was so happy to see the heat from her skin had gone, and the redness was calming. By day three, her skin was baby soft again, no sign of flakiness nor any bumps and was clear from redness. I’m so happy to say that having Bf serum as part of her skin routine, I know her skin will always be hydrated! Very impressed by the hydrating factor and how well it tackles inflammation. 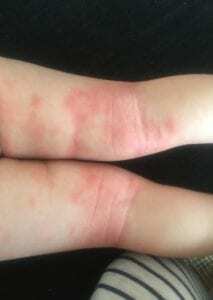 As there are unknown allergens/factors that are causing her eczema to react, we are still having some redness peek through in the problem areas such as behind the knees and arm creases etc every now and then but since using the Bf serum it hasn’t gone back to the severity as seen in the before photos. Why did Bf serum work for Aria? Eczema is a chronic skin condition that can’t be cured by applying a topical treatment. As Kathryn identifies and tries to rule out the allergens that cause Aria’s flare-ups, the best she can do is take the pain and discomfort out of the symptoms of her daughter’s condition. 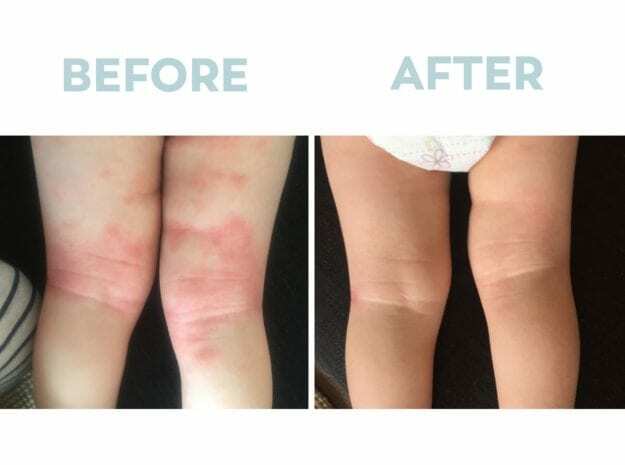 The reason Bf serum has worked so well in this instance is the powerful combination of natural phytonutrients that work synergistically to target all the symptoms of Aria’s eczema. Kathryn continually refers to the hydration she’s noticed in Aria’s skin and this is primarily due to the potent natural vitamin C content of Bf serum. Bf serum is pure extract of finger lime, and the vitamin C increases suppleness and hydration of the skin. As she was used to applying heavy creams and moisturisers, Kathryn was initially confused how a serum is powerful enough to offer such incredible levels of hydration. The texture of the plant extract serum and the lack of occlusive ingredients commonly found in moisturisers and creams means that a serum can penetrate the skin at a deeper layer working more effectively without blocking already inflamed pores. Vitamin C also works as an anti-inflammatory to reduce the pain and discomfort of redness, flakiness and itching that Aria had been experiencing. Last but definitely not least, vitamin C is also a potent anti-oxidant and while Kathryn works on Aria’s allergens and discovers what’s causing her painful flare-ups, Bf serum protects her skin from more potential damage caused by harmful free radicals in the environment. Ferulic acid helps protect skin from damaging environmental factors, particularly important when you’re dealing with allergies and skin conditions. Ferulic acid also retains the skin’s natural moisture deep within the cutaneous layers of the skin to add extra hydration. Tryptophan is a naturally-occurring amino acid found in finger lime and the most critical nutrient in Bf serum to treat the symptoms of eczema. While protecting the skin from harsh environmental factors (particularly important if allergies are the cause of eczema), tryptophan also helps repair the damaged barrier function of the skin which is the primary cause of pain, sensitivity, dryness, discomfort and itching. Oatmeal bath at night to gently cleanse the skin. Bf serum is applied to the entire body. Dressed in bamboo/cotton clothing for bed. In the morning, apply the serum all over again. “At the moment during the day, I am also applying a natural calendula ointment just on the problem areas to create an extra barrier. (The same ointment that didn’t improve her flare up on its own prior to using Bf). As you can see on Aria’s skin, the natural actives in Bf serum got to work straight away and Kathryn could see an improvement in Aria’s skin by the next morning. In as little as three days, the pain and discomfort had all but gone. To find out more about Bf serum and how it may help you treat the symptoms of eczema, email Lucy or send an Instagram DM to @biologiserum today.